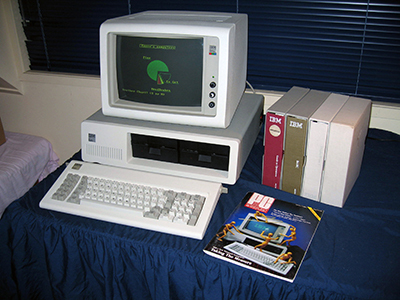 Released in 1981 the appearance of the much anticipated 16-bit Intel 8088-driven IBM PC on the world stage saw the microcomputer industry come of age and win the acceptance of big business. Things would never be the same afterwards! This model and it's subsequent clones for better or worse, established a software and hardware standard the legacy of which is with us today. It also ensured the dominance of Microsoft, the owner of PC-DOS and MS-DOS, the native operating system for this class of machine. Much to it's credit, IBM embraced open architecture much as the Apple ][ had done. This means every man and his dog could start producing add-ons (or clone the machine by reverse engineering the code). Every man and his dog could also write software for the new machine knowing that business would be buying these units in droves. As the old saying went back then "No one ever got fired for buying IBM". The release was accompanied by a slick marketing campaign utilising a Charlie Chaplin-look alike mime artist. It was novel and appealing. I've got a lot of fondness for this model as I used a monochrome one at work regularly for 2 years back in 1984-1986. I love the sturdy feel of the computer. The monitor display was always steady as a rock and crystal clear. Very unlike the home computers I was used to up to that point. Also, the keyboard! Although noisy (clicky), this was a joy to use with very solid feel to it. The only negative was the small shift keys, which were not quite where you expected them to be. Later PCs changed this configuration to a more standard one. It wasn't flashy but that machine spoke of quality workmanship. So it should! If I remember rightly it was close on $12,000 NZ dollars when purchased and that was way back in 1984!. This particular unit, a gift from a U.S.A. collector (thanks Eric), stumps up with 256k RAM, a Colour Graphics adaptor (CGA), colour screen and and two 360k floppy drives. It's in perfect condition physically and is complete with all its manuals and original PS-DOS 2.1 disks. I've added an original asynchronous communications card to it as well. In the main this unit works fine although there have been issues. The monitor started to play up a few months after I got the machine. It would simply switch off for no apparent reason. Eventually I plucked up the courage to dive into the monitor and fix the problem. The monitor is now good as new! Next, the machine threw a RAM IC. This was also fixed. Finally, a drive alignment problem seem to develop for some inexplicable reason. A re-alignment was undertaken. Hopefully things DO come in threes and that's the end of the problems for a while. One of my most prized computers.